At 74 years of age – 67 of which have involved active employment of the microscope – and with a library of over 13,000 volumes I have, naturally, formed an opinion regarding the usefulness of various books devoted to the theoretical and practical aspects of microscopy and microanalysis. In fact, in answer to requests on the part of microscopy students, I wrote “A Basic Microscopy Library” (1), and, more recently, “A Recommended Basic Microscopy Library”, as an Appendix in Essentials of Polarized Light Microscopy (2), a text-in-preparation for the McCrone College of Microscopy. The books recommended in these articles are intended for students representing all fields of microscopy, including pharmaceutical, forensics, industrial, and government. When the Editor invited me to write about my favourite books, I realized that my truly favourite books were not amongst those I had already written about! The reason for this is that the three or four most influential books that would determine the direction and course of my professional life were written for youngsters; they were the manuals that accompanied my chemistry sets and microscope set. So I would like to take the opportunity here to tell you about the truly favourite books in my personal odyssey. My mother told me that when I was six years old I noticed her greying hair, and asked about it. She told me that when mothers work hard and get old, their hair turns grey. I responded by declaring that when I grew up I would find a way to “cure” mothers from becoming grey. Accordingly, I requested a chemistry set to start my researches. December 1941 was a memorable time for me for two reasons: 1) America entered the War after the attack on Pearl Harbor, and (2) I bad turned seven years old and received for Christmas a beautiful Gilbert Chemistry Set (Fig. 1). The 200-page Manual (3) (Fig. 2) that accompanied that set, written in 1938, described 640 experiments, including the now infamous “Experiment 225 – Preparing a safe explosion”, which described how to make and detonate the very sensitive ammonium triiodide. This particular experiment, and all of the pyrotechnic experiments, would be successively eliminated from the Manual in later years. The first experiment I actually conducted with my new chemistry set was “How to make blue ink”. I can still recall the excitement of preparing test tubes of two solutions, one containing ferric ammonium sulphate, and the other containing sodium ferrocyanide, and the magic of seeing the two solutions mixed to produce a blue ink that I could actually write with! I would eventually perform this Prussian blue test for iron on a microscale many hundreds of times in my microanalytical career. Over the next year I performed all of the 640 experiments, and gained considerable knowledge and skill in applied chemistry. It didn’t take long before I realized that I needed a microscope in order to see up close not only the human hair that I was working with, but, in addition, throughout the Manual’s sections on crystals and crystal growing, there would be statements to “look at the crystals with your microscope”. It was simply assumed that a microscope should be available in the chemical laboratory. In the days following the next Christmas, when I was eight years old, I was invited by a school chum, whose father was Toy Department Manager at a large retailer, to rummage through toys that had either remained unsold after the holiday, or were returned. There was a Gilbert Microscope Set in that storeroom, and both of us went for it! Unfortunately, my friend got to it first, and I ended up choosing a Pirate Cap Pistol. This cap pistol, however, was a thing of beauty, with its side-by-side double barrels, double hammers, and two-stage trigger! What’s more, the double BANG BANG of its barrels demanded attention – a lot more than a staid microscope set! Needless to say, we struck up a trade, and I got my microscope. 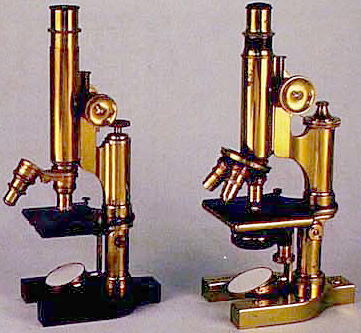 The Gilbert Microscope Set (Fig. 3) was supplied with a microscope that was not of good quality, but it was all I had at the time. Interestingly, the microscope was supplied with a “Polaroid Jr.” and a polarizing cap analyzer – this just a few years after the introduction of Edwin Land’s polarizing film. It was the book that came with the Gilbert Microscope Set, however, that would be my all-time favourite, and the one that would determine a major direction in my life. The 115 page book (Fig. 4) was called Exploring the World with the Microscope (4). It was written in 1938 by Oscar W. Richards. Readers of this Journal will know Oscar Richards from his long association with the Spencer Lens Company/American Optical Company, for whom he was Chief Biologist; he wrote their manuals on the care and effective use of both the microscope and microtome (5). He was one of the authors of Phase Microscopy (6), and would later be President of the American Microscopical Society, and Editor of that society’s Transactions. What is so special about Richards’ Exploring the World with the Microscope? The answer is in the title. Today, as in the past, we pigeonhole scientists according to their fields of speciality; they are organic or inorganic or physical chemists, for example, or botanists, zoologists, histologists, mineralogists, metallurgists, forensic scientists, etc. Richards made no such distinction when it came to the microscope; he urged the collecting and storing of all kinds of specimens. The breadth of the practical applications are indicated by some of the chapter titles: Measuring with the Microscope; Photomicrography; Hair and the Fur Industry; Fundamental Units of the Inorganic World (dendrite crystals of aspirin, starch test with iodine, crystals from fusion, effect of gelatine on crystal growth); The Classification of Crystals; Chemical Microscopy; Fundamental units of Living Organisms; Unicellular Plants and Animals; Mosses, Ferns, and Flowering Plants; The Many Celled Animals; Printing; The Structure of the Photographic Image; Metallurgy and the Microscope; Textile Microscopy; The Use of the Microscope in the Paper Industry; Detective Work with the Microscope; The Use of Polarized Light; Other Applications of the Microscope (spices and their adulteration, cigar and cigarette ash collections, snow flakes, sound grooves in a phonograph record, etc.). Imagine what a youngster would learn performing all of these experiments in his early formative years; the active, imaginative years, before adult influence, with only nature and one’s own observations as teacher; the unlimited capacity to take in all of the wonders surrounding us everywhere; to be intoxicated by the magic of it all. I heard the music of the Pied Piper, and did all that he bade. Richards directed me to “go to mother’s kitchen and make a collection of all of the powders there. Look at them with your microscope. Draw what you see”. Today my collection of vials of dusts and powders numbers many thousands, and when Walter McCrone invited me to leave teaching biology and chemistry in the public school system, and join him in “cataloging the universe”, I was ready; I had been preparing for it all of my life; the cataloging still goes on (www.mccroneatlas.com) – it’s perpetual. 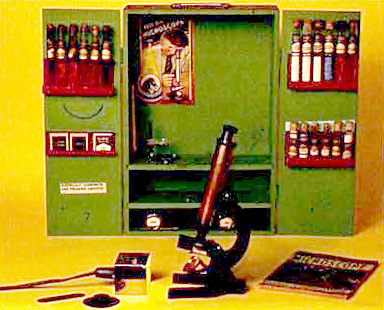 By the time I was 12 years old or so, I had replaced the Gilbert microscope with a rather basic, but “real” microscope, a Bausch & Lomb (Fig. 5, left), and several years after that I added a more advanced Bausch & Lomb (Fig. 5, right). In addition, I had acquired a Chemcraft Chemistry Set (Fig. 6 Porter Chemical Company) which had its own Master Manual of Experiments (7 and Fig. 7) and a set of Bryan valence blocks from which I learned the principles of valences. Thus, as a youngster, the three most influential books for me were the two chemistry set manuals, and, especially, Oscar Richards’ Exploring the World with the Microscope. The other booklets that came with the sets, including the Glass Blowing and Chemical Magic contributed to my basic knowledge in those areas. When I was a teenager, two other books would have an enormous impact on me and on what would be my career. The first of these was Handbook of Chemical Microscopy (8) written by Chamot & Mason; for me it was the two-volume 1931 edition; there it is again, the pairing of chemistry and microscopy. Volume 1 of this work would introduce me to more microscopical techniques, and Volume 2 shifted my chemical practice away from semi-micro scale to the micro scale. The second book was Shillaber’s Photomicrography (9). I made my first photomicrographs with an inexpensive plastic camera supported in a ring stand over my microscope. The camera had a fixed f/8, and two speeds – Instant and Bulb. I used the sun as a light source, and viewed the disastrous results on the negatives; I made every mistake imaginable, but learned something from each of them. I did not know about Kodak’s publication in the field, and in my wildest dreams never imagined that I would one day write the last editions of Photography Through the Microscope (10)! The thing I liked about Shillaber is that he always encouraged one to try different optical components and procedures. This appealed to me because I couldn’t afford matching microscope components, and acquired objectives, eyepieces, and condensers of different manufacturers where I could. For the same reason I liked Shillaber, a little later I very much favored Needham’s The Practical Use of the Microscope (11). Substage condensers, especially, are not interchangeable between manufacturers, but Needham taught me to make adapters, so that I could experiment using any combination of any manufacturers, and an adjustable, graduated drawtube with RMS thread at the lower end was a “must”. I was introduced to apertometry and ultra-violet fluorescence here too. The one subject-area that was not covered in detail in any of my favourite books so far was optical crystallography, and this subject was vital for my understanding of crystalline materials. The book that I learned from, and still consult often, is an old one, but a classic; it is Albert Johannsen’s Manual of Petrographic Methods (12). This served and serves – for the theory, but today one can only drool over the descriptions of the many specialized compensators and other accessories that are now rare and no longer readily available. For the preparation of biomedical specimens, I knew of Bolles Lee, but always preferred Peter Gray’s The Microtomist’s Formulary and Guide (13). When I studied embryology in college, we were expected to grow our own chick embryos, make our own serial sections, stain and mount them, and those were the slide preparations we used for study during the semester. I understand that this later changed to students being issued sets of prepared specimens, and later still – dare I believe it? – students were issued microfiche of photomicrographs of pre-selected areas of tissues, and a viewer, making the microscope obsolete. At any rate, Gray’s book was my first guide in this area. Another of my favourite books is Fritz Feigl’s Spot Tests (14); there have been many editions, but for me it was the 1954 two-volume edition; volume I Inorganic Applications; volume 2 Organic Applications. As the title suggests, these are chemical tests, often colorimetric, conducted in the depression of a spot test plate, or a depression slide. They are extraordinarily sensitive reactions, and not really intended to be microscopical. However, when one day I was looking for a means of detecting protein in a microscopic particle, I consulted Feigl, and selected the protein test utilizing tetrabromophenolphthalein ethyl ester. The resulting blue color was so intense that I thought I would try forcing the test down to microscopic size. I found I could obtain a positive result on a couple of epithelial cells, and have used the test many times since. Many, many of the tests described in these volumes can be used at the microscopic level and that is why this work remains a source of great potential for me. It deals with the investigation of things as they are without any limitations to the scope. It emphasizes the identification of materials – inorganic, organic; organized (biological), common, rare, described or not described in the accessible literature – as they actually occur in nature and industry, or are met in the investigation of mishaps and crime. This book is like a grown-up version of Exploring the World with the Microscope, and I love them both. I might conclude this list of books with the final edition of Simon Henry Gage’s The Microscope (16). This remarkable book was revised and used for over half a century, from the late 1800s to 1947, through seventeen editions, and included the specialized Darkfield edition and the Ultraviolet edition. These have been my truly favourite books, and are those that happened to be available to me from the 1930s through the 1950s; the ones that formed the basis of my professional practice, as well as my hobby. They represent mostly American authors or American imprints. In the mid 1960s I was able to make my first trip to London, where my first visits were to Collins & Gray, in Museum Street, and Brunnings in High Holborn. Here I saw the books by Quekett, Carpenter/Dallinger, Spitta, and Hogg, The Micrographic Dictionary, and many of the other volumes that I had read about in bibliographies, but that had not been accessible. And now here they were, and that started a whole new set of favourite books!! And then there was the Internet that made available Behrens, Berek, Groth, Rosenbusch, and still another new set of favourites! Many thanks to Brian Bracegirdle for his invitation to reminisce about the favourite books of a chemical microscopist. 1. Delly, J. G. (1986) A Basic Microscopy Library, The Microscope, 34, 11–25. 2. Delly, J. G. (2006) Essentials of Polarized Light Microscopy. College of Microscopy, Westmont, Illinois. 3. Johnson, T. B. & Shelton, E. M. with Gilbert, A. C. (1936). – Chemistry for Boys. New Haven, Connecticut: A C Gilbert Company. 4. Richards, O. W. with Gilbert, A. C. (1938) – Exploring the World with the Microscope. New Haven, Connecticut: A C Gilbert Company. 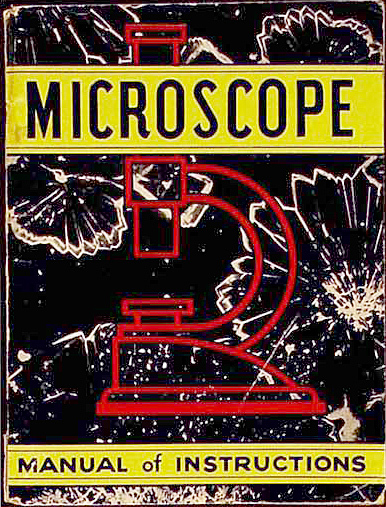 The from cover of this 1938 version shows a schematic, in red, of a microscope, and is entitled MICROSCOPE: Manual of Instructions. 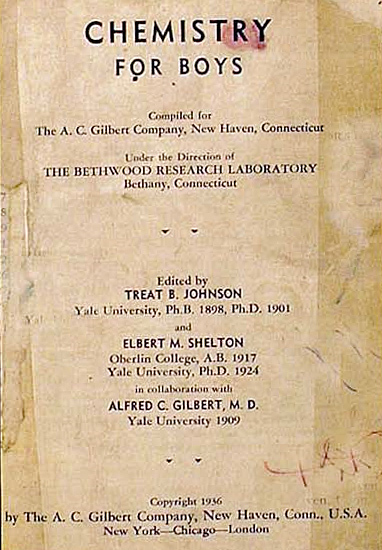 Another version, with a 1937-dated sticker pasted over the A. C. Gilbert name, and attributed to The Meccano Company of America, has the same cover, but is titled MICRO CHEMISTRY; Manual of Instructions. A later version, but still dated 1938, has a green and white cover, showing specimen preparation, with an illustration of a microscope in black. It is titled How to use the Gilbert Microscope. The cover of a still later version, bearing the 1938 imprint, but probably from the 1950s, shows two boys using a microscope on a blue background with a half dozen research scenes; it is titled Fun with the Microscope; Gilbert. All versions have the same title page: Exploring the World with the Microscope. The earliest – and recommended – version has 266 experiments; the three later versions have 164 experiments. The bibliography in all remains essentially unchanged, with the most recent reference dated 1936. 5. Richards, O. W. (1942, 1949, 1959, 1971, 1975 (5th Edition) – Effective Use and Proper Care of the AO Microtome. Stanford, Connecticut: American Optical Company. 6. Bennett, A. H., Osterberg, H. Jupnik, H. & Richards, O. (1951) – Phase Microscopy; Principles and Applications. New York: Wiley. 7. 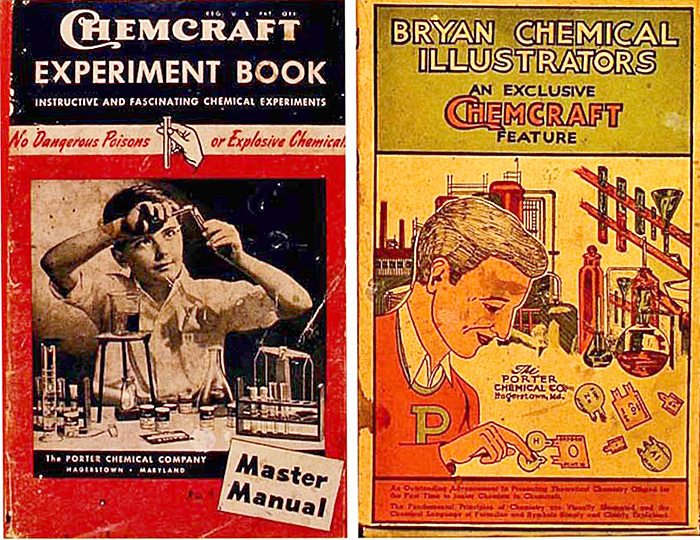 Porter, H. M. & Porter, J. D. (1940) – The Master Chemcraft Experiment Book. Hagerstown, Maryland: Porter Chemical Company. 8. Chamot, E. M. & Mason, C. W. (1931) – Handbook of Chemical Microscopy. 2 volumes. New York: Wiley. 9. Shillaber, C. P. (1944) – Photomicrography in Theory and Practice. New York: Wiley. 10. Delly, J. G. (1980, 1985, 1988) – Photography Through the Microscope. Rochester, New York: Eastman Kodak Company. 7ed 1980, 8ed 1985, 9ed 1988. 11. Needham, G. H. (1958) – The Practical Use of the Microscope. Springfield, Illinois: Thomas. 12. Johannsen, A. (1914) – Manual of Petrographic Methods. New York: McGraw-Hill. [2ed 1918]. 13. Gray, P. (1954) – The Microtomist’s Formulary and Guide. New York: Blakiston. 14. Feigl, F. (1954) – Spot Tests. Vol. 1 Inorganic Applications; Vol. 2 Organic Applications. Amsterdam: Elsevier. 15. Benedetti-Pichler, A. A. (1964) – Identification of Materials via Physical Properties, Chemical Tests, and Microscopy. New York: Academic Press, and Vienna: Springer-Verlag. 16. Gage, S. H. (1941) – The Microscope. Ithaca, New York: Comstock, 17ed.